Another month has been and gone and my little boy is now 7 months old. This month he's seemingly transformed right in front of my eyes into this very mischievous little dude. 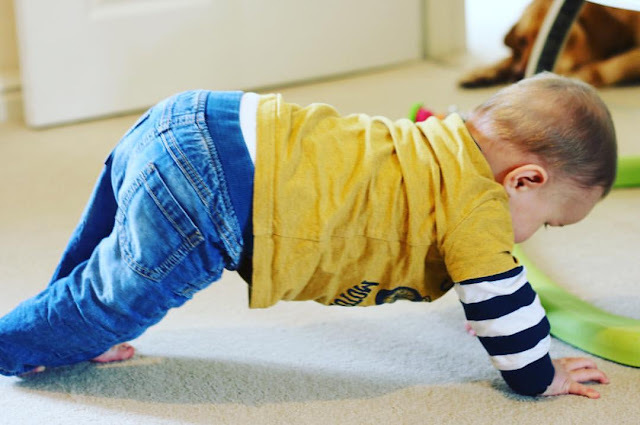 He is now very mobile and get where ever he wants by doing a weird little shuffle crawl which I've dubbed "The Worm". Whilst I know this is such a major milestone a little part of me want's him to stay little forever. I think that's fairly normal with your "last" child. Plus, he now want's to get into absolutely everything including, shelves, drawers and chomping on wires. Some serious baby proofing needs to take place in our house! This month has also been a little challenging for him, he has had to become a little more independent as I returned to work a few weeks back (though I have had two wonderful weeks off for the Easter Holidays). He did so well, taking bottles from his daddy and going to sleep without the aid of a magic boobie feed - he adapted brilliantly. I think Jamie enjoyed spending more one on one time with him and Henry enjoyed spending more time with his Daddy. 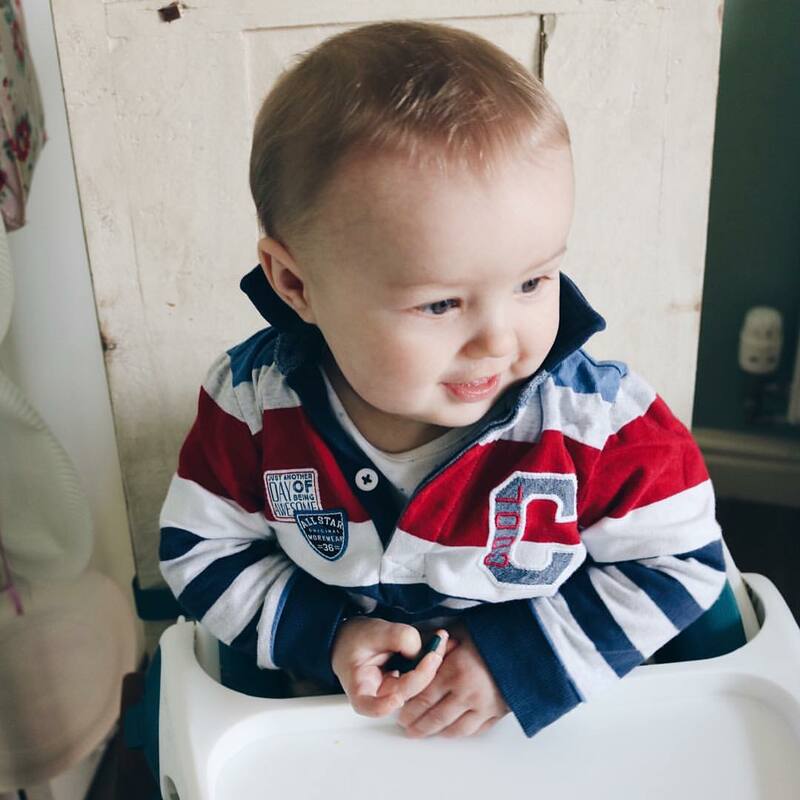 Tomorrow he head's off for his first full day at nursery, his big sister will be showing him the ropes - she's apparently saved him a seat next to her at their dinner table! I have no doubt in my mind that he will be fine, he enjoyed his settling in sessions and his key worker is wonderful (she was Darcie's key worker when she was in the baby room, so we know her well). Food wise Henry is doing amazingly. He literally loves everything and we're enjoying the journey of weaning. It has definitely been a lot more stress-free second time round. His favourite foods currently are courgette, pear, banana and toast. 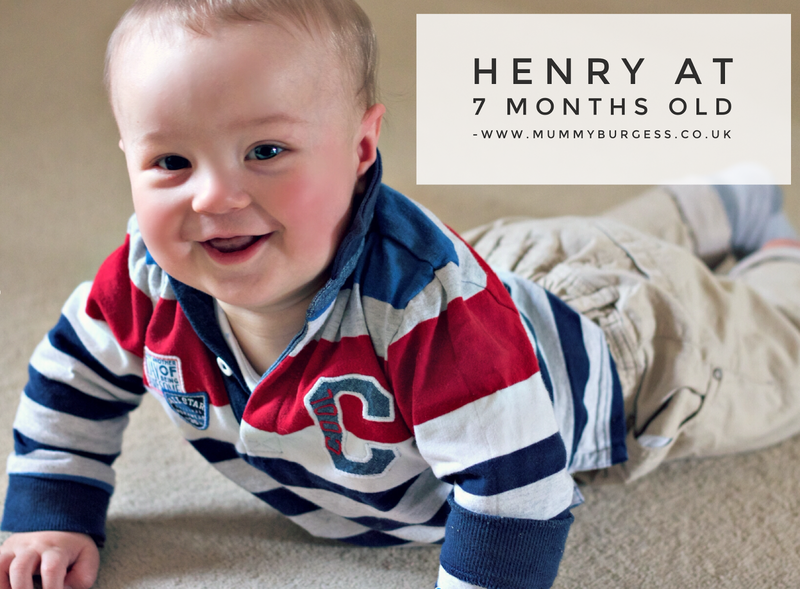 This month I'm going to try and make more of our family favourite's baby friendly so Henry can have what we're having - there will be a lot of cooking from scratch, which I love doing anyway. Another major milestone was that Henry said "Dadda" for the first time. Now everything is Dadda!! It was rather amusing the first time he did it, I had just got home from my first day back at work and all I could hear was "Dadda dadda daaaaaadddaaaa". I was not amused, though Jamie seemingly was. So little dude, please slow down. Mummy can't keep up with all your magical moments.